Feigning is a serious concern for clinicians in forensic and medical settings. The current study examines differences in response style for feigning vs. non-feigning groups on three commonly used measures: the Minnesota Multiphasic Personality Inventory (MMPI-2-RF), the Structured Interview of Reported Symptoms (SIRS), and the Personality Assessment Inventory (PAI). For this meta-analysis, we found 17 studies that compared respondents who were legitimately mentally ill to respondents who were asked to fake or feign their responses. Overall weighted average effects sizes (Cohen’s d) were calculated for each measure. Very large effect sizes were found across all three measures, with the overall d-values for the MMPI-2-RF, SIRS, and PAI being 1.72, 1.71, and 1.06 respectively. 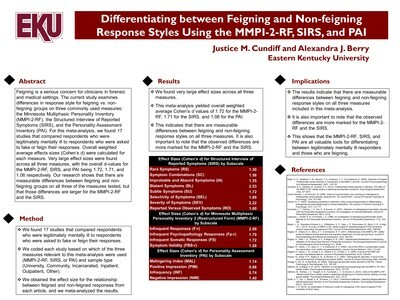 Our research shows that there are measurable differences between feigning and non-feigning groups on all three of the measures tested, but that those differences are larger for the MMPI-2-RF and the SIRS.